Spiegel & Grau, 9780385523233, 368pp. NEW YORK TIMES BESTSELLER - In this thrilling new novel from the author of Water for Elephants, Sara Gruen again demonstrates her talent for creating spellbinding period pieces. At the Water's Edge is a gripping and poignant love story about a privileged young woman's awakening as she experiences the devastation of World War II in a tiny village in the Scottish Highlands. As she embraces a fuller sense of who she might be, Maddie becomes aware not only of the dark forces around her, but of life's beauty and surprising possibilities. 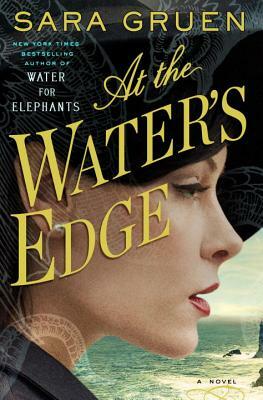 Sara Gruen is the #1 New York Times and USA Today bestselling author of At the Water's Edge, Water for Elephants, Ape House, Riding Lessons, and Flying Changes. Her works have been translated into forty-three languages and have sold more than ten million copies worldwide. Water for Elephants was adapted into a major motion picture starring Reese Witherspoon, Rob Pattinson, and Christoph Waltz in 2011. She lives in western North Carolina with her husband and three sons, along with their dogs, cats, horses, birds, and the world's fussiest goat.